These two should be treated like bookmarks to an atomic grouping of ANT tasks. For example, in your build file, you may have the following targets: setupenv, compile, test, deploy. The first sets up the environment ensuring you have the correct permissions, file sets, jars, and checks out the latest from the team stream into a local workspace. The second task compiles using the ecj-3.4.2.jar tools. The third runs JUnit tests (and perhaps functional tests as well). The last one deploys the application. You should bookend each target with startBuildActivity, and completeBuildActivity. That is put these just inside the target itself, with all the meat of the target between the start and complete activity elements. This will tell the Jazz Build Engine to notify the Jazz Team server that it is starting on that particular task. Once the task is complete, the completeBuildActivity says "hey.. I'm done with this". That way, you can more easily tell where in your build the process fails without having to dig through your log files. 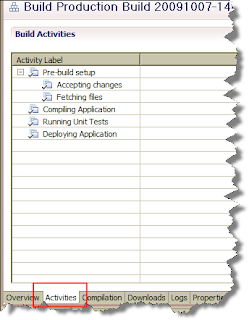 In the Eclipse/RAD/RSA/RBD client you can then see the total status as the build is progressing. You can refresh from the button on the bar in the view and you will see it change status. For this application I did, it will say "Fetching files" or "Compiling Application", etc. Once complete, you can also check the status of each task on the "Activities" tab of the build. This tab will also show you exactly how long each step took. This may be helpful if you need to trim down the amount of time it takes to run a build.